It is unlikely that we will learn anything new that has not been said before, but FOX Sports reporter Chris Myers will sit down for an interview with University of Florida "coach in waiting" Urban Meyer before tonight's kickoff of the 2010 Allstate Sugar Bowl. Here is the press release from FOX Sports. 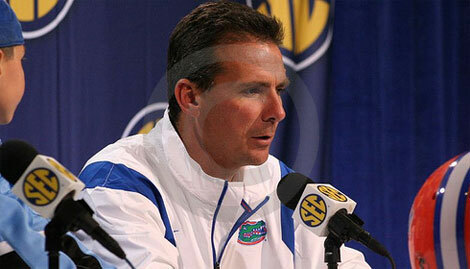 MYERS SITS DOWN FOR ONE-ON-ONE INTERVIEW WITH FLORIDA HEAD COACH URBAN MEYER – Before Tim Tebow and the Florida Gators take the field to battle the unbeaten Cincinnati Bearcats in the ALLSTATE SUGAR BOWL this Thursday, Jan. 1, (8:00 PM ET) FOX Sports reporter Chris Myers (pictured left) will sit down with Florida Head Coach Urban Meyer. Earlier this month, Meyer announced his resignation due to health reasons but quickly changed his ‘resignation’ to a ‘leave of absence’ and expects to be on the Gators sideline when next season opens. But how will he do it? Myers will talk to Meyer about what went into Urban’s decision, his current health and what the head coach sees in the future for himself and the University of Florida football program. The one-on-one interview will be taped on Thursday and shown during FOX’s BUILT FORD TOUGH BCS pregame show.